Don Devendorf, an engineer manager with Hughes Electronics, designed systems that were not incorporated by factory racing teams. In 1975, he formed Electramotive Inc and Electramotive Engineering with a friend, John Knepp. Each member of the team came from the local aerospace industry. They all were familiar with the latest technologies. Don Devendorf took part in the IMSA Radial Challenge, which he won in 1977. 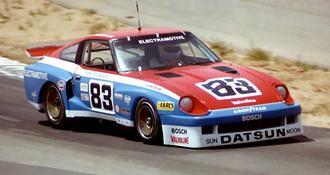 He switched to the IMSA Camel GT Challenge in 1979, and he won the GTU Championship in 1979, driving a Datsun 280ZX. In 1982, he won the GTO Championship with the little Datsun 280ZX Turbo. From that moment, his goal was to compete in the GTP Category. Unable to build a new car, Don Devendorf, Wes Moss and Yoshi Suzuka approached March Engineering, but they were not interested in the project. Lola was interested and Eric Broadley began to work on the new T810 model. The chassis needed slight modifications to allow for the Nissan engine, the bodywork and cooling installation. As Nissan began producing the new VG30 engine, a twin turbo 3,2L alloy block, John Knepp developed the motor to produce up to 1000hp with the use of one single Garrett T03 turbocharger coupled with an Electramotive fuel injection system. The use of a Weismann transaxle proved to be a wrong choice and it was later replaced by the Hewland VGC five-speed. The bodywork was designed by Yoshi Suzuka. Lola had worked on the project in order to deliver the car by october 1984, but it proved too short and the car was not to debut before April 1985. It failed to start the race at Riverside, as the transmission failed in practice. The car did really debut at Laguna Seca with its new California Cooler livery. Don Devendorf and Tony Adamowicz finished eleventh. During the 1985 season, it seemed that the car would make promising starts, but some minor trouble would systematically slow down the car and no good results would be registered. Don Devendorf knew, as a pragmatic engineer, that the car would become a winner when every problem would be resolved. "We later found out in our own wind tunnel testing with a moving ground plane, that the early GTP body configuration had some inherit defects with air flow. Later many changes were incorporated to improve that , and later event a new tub and body was designed here." Tony Adamowicz quotes. "The chassis and suspension pieces had considerable failure rates, often breaking in opportune times". The car was a quite promising one, and Tony Adamowicz did participate in its early development. He can tell us more : "The GTP car additional downforce incorporated through tunnels and external air devices made significant improvement with the car's performance. The 3 liter twin turbo was able to produce exceptional power in a compact package. We ran in the 700 hp range during the races, with approximately 650 foot lbs of torque. The engine was capable of producing close to 1500 HP on the dyno for short bursts. Most of the chassis, tire development of the early California Cooler Black car was not able to keep up with the power the engine could develop." Later, Tony would be replaced as driver, but his experience did bring the team a lot of information that proved valuable for the next races. Don stayed on with the team and provided the engineering expertise for the engine management system as well as other developments. It took a long time for that list to get checked off. Then came Kas Kastner, who had been asked by Nissan's John Borgan to head Nissan Motorsport's program. He quickly established himself as the middleman between Electramotive and Nissan. Then Electramotive had to evolve. Elliot Forbes Robinson was the new lead driver. For 1986, the car had new colors, and as the year went by, the car wound up some good results, with various drivers, after two dnfs at Riverside and Laguna Seca, Geoff Brabham was hired on a race by race basis. He led most of the race at Portland, but had to stop for a splash and dash to finish eventually third overall. They had failed to win because of a poor strategy. Their other results were a fourth at Sears Point and fifth at Columbus. For 1987, Nissan provided a more important support for the GTP effort and Don Devendorf gave up his racing career as stress was too hard to sustain. Electramotive was gaining in importance and the cars were greatly improved for that new season. Geoff Brabham and Elliot Forbes Robinson won their first race at Miami. The remainder of the season was a succession of good starts and dnfs. A quite disappointing season for the team, whose biggest problem was getting the tyres to last. They wore Bridgestone, and blowing them regularly, so they finally switched to Goodyear. The results improved immediately. In 1988, a new chassis was built by Trevor Harris. IMSA had introduced new rules in order to reduce the tremendous horsepower produced by the turbocharged engines. But John Knepp built a new electronically-controlled turbocharger wastegate into the engine management system and the car proved even faster. Skipping the two first races of the season, Nissan began dominating the series. Geoff Brabham and John Morton, driving the "8801" car, won at Road Atlanta in an impressive way, starting from the back of the pack. Then, it was a string of victories at West Palm Beach,Lime Rock, Mid Ohio, Watkins Glen, Road America, Portland, Sears Point and Columbus. Only San Antonio and Del Mar were non-Nissan victories. Geoff Brabham easily won the 1988 title. 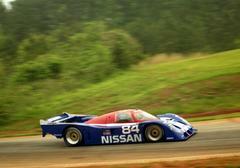 In 1989, Nissan continued to dominate the series, and a second chassis was built, named 8802. Nissan had decided to go for the long distance races and entered the two cars at the 24 Hours of Daytona. But it was with no success, as the two cars retired from the race. It was a different scenario at Sebring where Nissan registered its first victory on a long distance race. Geoff Brabham, Chip Robinson and Arie Luyendijk won the race, beating Jaguars on their favorite ground. They had won at Miami and next at Road Atlanta, Lime Rock, Mid Ohio, Watkins Glen, Road America, Topeka, San Antonio and Sears Point. They were beaten at Portland, Del Mar and West Palm Beach. At the end of the season, it was again Geoff Brabham who took the title, second was Chip Robinson who won seven races to Brabham nine. As Nissan was surfing on the wave of success, Electramotive was having its identity crisis. It was a small structure that was not completely prepared for so much success. At that point, Don Devendorf was thinking about selling his team. And that is what happened as Electramotive became NPTI, a subsidiary of Nissan USA. Kas Kastner became the executive vice president of the operations, and Don Devendorf senior vice president of research and development. NPTI was moved to a new facility in California with engine shop, wind tunnel and so on. NPTI had all the elements that made it a winner. In 1990, the season began as per usual, with dnfs at Daytona, but with back to back victories at Miami, Sebring and West Palm Beach. A brand new car was to debut at that very race. Brabham won a new title, the third in a row and again in 1991, but in a less impressive way than the previous ones. At that moment, Toyota had introduced a new car, and it was to be the car to beat for the next season. In 1992, Geoff Brabham finished third overall with an obsolete car. Nissan's plans for the future proved to be desastrous for the future of NPTI. A new car was to be developed, the P35, but that car never really made it to the track. Nissan was undergoing a recession and NPTI was an easy target. At the beginning of 1993, it would be dissolved and the last car to be seen was in the hands of Gianpiero Moretti, who tried to do his best with an obsolete car. Many thanks to Tony Adamowicz, who provided me with a lot of useful information.